Looking for a USED TT-LM1000T/RY? 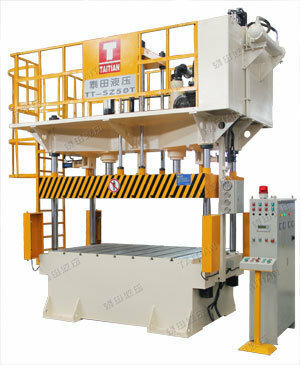 Xiamen Taitian Machinery Manufacture Co., Ltd., founded in 1998, is one of the biggest gantry type hydraulic press manufacturers in Fujian Province. Our biggest capacity can reach 6000T. we have got CE certification,ISO certification, SGS certification, Our normal products line is : hydraulic deep drawing press SMC hydraulic press Hot forming press hydraulic compression molding press hydraulic Cutting press hydraulic Blanking press Forging press Punching press Die spotting press We have three sturcture : H type, four pillar press ,C type press. 89 ModelsView more about Xiamen Taitian Machinery Manufacture Co., Ltd. Looking to Purchase a New TAITIAN TT-LM1000T/RY?